For years before the sewerage system was installed in Ipswich, much of the effluent flowed into the Ipswich River. At low tide the odor from this sewage was almost unbearable, particularly in the Cove area. In about 1934 the late Chester Bolles, whose home was on Turkey Shore Road, thought of an idea which would eliminate this odor and was willing to donate $500 towards the project. His idea was to contract a dam three feet high across the river just above the Green Street bridge. In this way, even at low tide, there would be three feet of water in the Cove at all times. 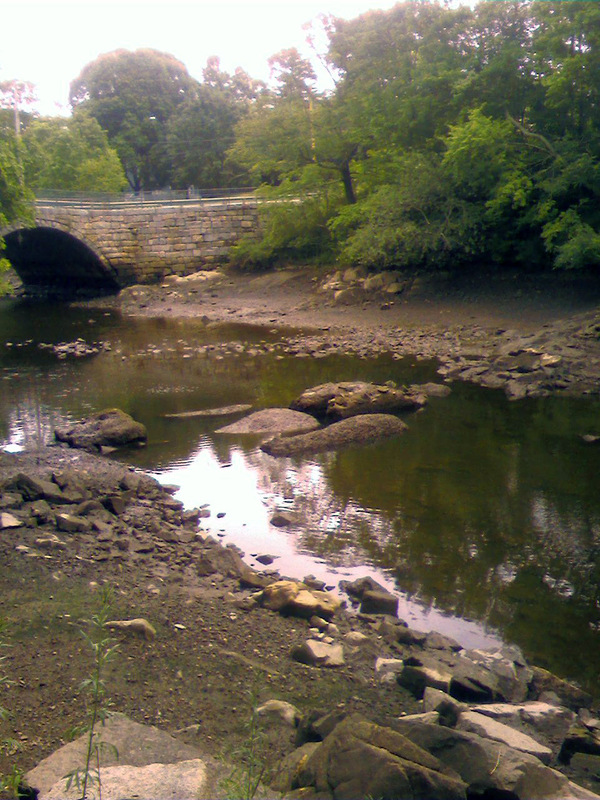 Remains of the Green Street dam, looking toward the Green Street bridge from the Sidney Shircliff Riverwalk at low tide. The idea was a good one. It was during the time of the Great Depression and many people were out of work and had been assigned to the government W.P.A. project. This was a program in which the government provided funds to carry out worthwhile projects that would create employment. The town accepted Mr. Bolles’ offer and sought further funds from the government. These funds were approved and work began in the late fall of 1934. However, it was a poor time in which to build a dam. First, the winter was very severe and at times when the cement was being poured the glass was below zero and the freshet in the river was very high. The only reason the project was being done at this time was because the men needed work. Forms were washed away and the pounding of the fast-flowing water was too much for the new cement. The center of the dam was soon washed away, and by spring the new structure had almost disappeared. Five hours later at high tide, the failed dam is not visible. I remember hearing about this project as a child, my grandfather was Chester Bolles. It’s a shame the timing was Off.